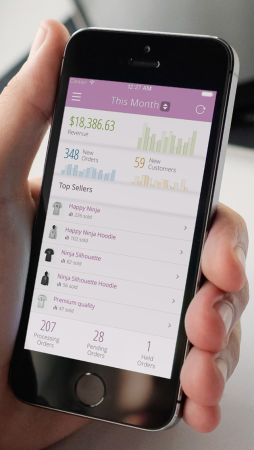 Just over a year ago, we shipped a product we’d partnered with WooCommerce to build that we thought would be a great addition to the WooCommerce platform: the WooCommerce iOS app. Our goal was to build something that would let store owners keep a pulse on how their store was doing, and that this would evolve into a tool that would let WooCommerce shop owners manage some of their store on-the-go as development progressed. We learned a lot of lessons while building this app, and partnering with Jay at WooCommerce to do an entirely new sort of development was really exciting for our team. It gave us the opportunity to be heavily involved in the WooCommerce REST API development while learning more about mobile apps and the iOS platform. We were the right sort of team in the right position to get the app built and launch an MVP as leaders of the initial REST API implementation (which the app relies on to communicate with your store), and this let us get extremely valuable feedback from our customers to see what new features would be most important to them and drive further development. However, we’re not necessarily the right sort of team to take the app to the next level for WooCommerce shop owners. As a result, the WooCommerce iOS app development was transferred to WooCommerce in April of this year, and they’ll continue to build the app. With the acquisition of WooCommerce by Automattic, the Woo team is in a great position to continue to improve this app. Automattic has deep experience in building mobile apps with WordPress, and WooCommerce joining the Automattic team gives them the right tools to improve the app and add features in response to the great feedback we’ve gathered from the initial versions. While moving on from a project is always a bit sad, we’re proud to have had a hand in building the initial app, and will be cheering the app on from the sidelines with full confidence in the WooMattic team to make this a must-have store management tool. A special thanks goes out to each one of you who purchased the app and gave us feedback on what you liked, didn’t like, and wanted to see improved, as this information was really valuable in planning the future of the app — which is left in great hands 🙂 . Hi guys! Great news for us who purchased app, not the same for you in terms of earnings..
By the way, the app should have been heavily updated since it was a little bit useless. So… I hope the purpose of this app will be that to better assist vendor in managing his store in much more stages than now.